Today in marketing in two minutes or less… hey everybody, small business Stacy here. Now, when you check your mail every day you probably have the same process that I do. You bring it in and you sort of sort it into A, B, C pile mail. Now as you can see, my stack is pretty big here. But when you get something like this, right? It’s gonna get your attention and this is A pile mail. You’re gonna wanna open it. Well, this is what I got yesterday. Let’s see what’s inside. S’mores! And a letter. Now there are a lot of marketing lessons you’re gonna get today. Obviously number one, A pile mail. Lumpy. You want lumpy mail. Number two, a personalized letter tying into what’s on peoples minds. Thanksgiving. But that’s just not all the brilliance of it. Listen to this. Stacy, why did I send you a box of S’mores? I was wondering. There are two reason. Summer came and went in a flash this year, and you may not have had time to sit by a campfire and make your own S’mores. So, I wanted to fix that. And number two, everyone and their dog is probably sending you holiday greeting cards and wishes for Thanksgiving, but who else is sending you S’mores? A business without a mailing list is not a business. Right there are some valuable marketing tips. I wanna commend Kevin Donland from Marketing Multipliers for this brilliant package. Now Kevin goes even above and beyond, because that’s not all the marketing lessons today. You see, Kevin really pays attention to the T in my Action Marketing System, which stands for transactions. Because Kevin doesn’t send me just one thing of S’mores, which would be nice right? But then in about 30 days I might forget about Kevin. Sorry, Kevin. But Kevin shows up in my mailbox every single month. You see, because it’s not my job to remember to do business with you, it’s your job to remind your customers, clients and patients to do business with you. So, show up regularly. Build those transactions so that when they need your products or services, the only possible person they can think of is you. And Kevin does this brilliantly. I also love that not only is he sending S’mores, I mean this is like an expensive product and it cost about seven bucks to send that package to me. So, he’s not going cheap. You see, Kevin does copywriting and he is not sort of out there pitching himself as a commodity. I’ll write ya a letter for $10. His prices start at $10,000 and more. So, that’s another valuable tip. Stop underpricing yourself. And if you need help with that, give me a call. I can certainly help you with the strategy. But Kevin is right, by charging higher prices you get a higher level client and you have no problem sending valuable things that keep you front of mind. Alright. I lost track of how many valuable marketing lessons were provided today. If somebody can keep track, leave me a comment below. Alright. This is small business Stacy, your Small Biz Marketing Specialist. 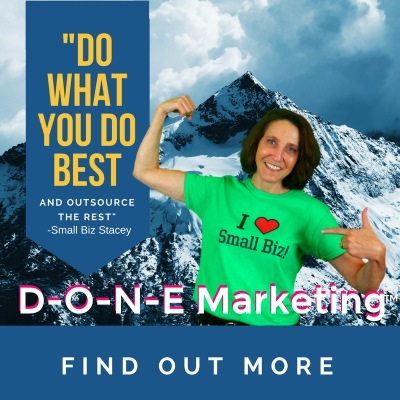 Here to help you get your marketing into action and eat s’mores by helping you become a #SmallBizMarketingWiz.